Yesterday on the way home I was wondering what we should get for Baby Girl since today is Hinamatsuri (Girl’s Day). 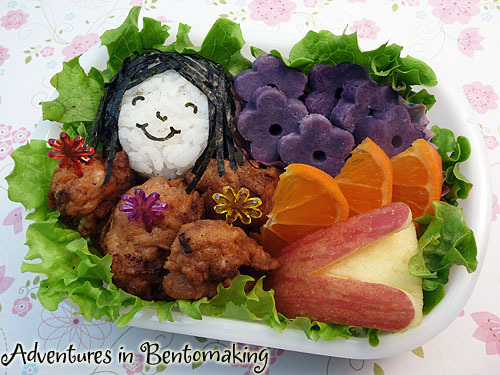 After a bit, it dawned on me that I have the ability to give her a great gift… a bento to take to school! A lot of people assume that I make all my lunches here for the kids, but in reality I make these lunches for myself. My kids’ preschool tuition includes lunch, so it doesn’t really make much sense for me to send them to school with food. I consider what I do here for myself good practice for when they get to elementary school, when it would make more sense. Anyway, this is the first lunch I’ve ever made her for school. I put some leftover mochiko chicken in here, which I’d had in a bag in the freezer. Aaand I just remembered I forgot to post my Pork Tofu recipe yesterday… I’ll try to remember tonight. For the first step, I added some green leaf lettuce. It was rather out of control, so I had to give it a good talking to before it calmed down. I have an onigiri mold for a little boy’s face, so I used that and added these little nori strips that I bought. You can easily just cut your own strips or use soy paper for different colored hair. Okay, maybe not that long, but it sure is better than throwing away a whole straw after you use it. Next, I added an apple bunny and then tucked in some cutie tangerine slices. 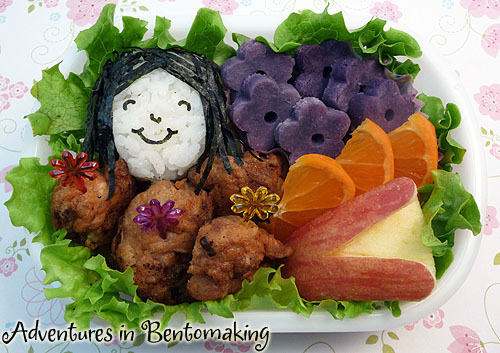 For final touches, I added some fresh nori strips so that her hair looked longer, tucked some little scraps of lettuce into the sides to hide some holes, and put three flower picks into the chicken. She was so happy to see it that we had to coach her all the way to school to ensure that she shouldn’t gloat about having a special lunch, lest she make others jealous. Then as if on cue, when she asked to hold it, Buddy makes Ultimate Sad Face at me and says, “Where’s my bento?” We let him hold it all the rest of the way and he seemed happy with that, but it looks like I’ll be making him one when Boy’s Day comes around. This was really fun to make, so I’m actually looking forward to making her lunches when she hits kindergarten. I just wonder how much of this she’ll really eat… She’s probably starting lunch in about 10 minutes. Her teacher seemed confused when I gave it to her, asking if it was for lunch. lol They better not forget it in the fridge! I have a bento for myself today too. I sketched both of these out last night while watching Heroes. We made this for dinner on Saturday and amazingly enough, Baby Girl did a lot of the work. I found a recipe for Chicken Cordon Bleu Bites on All Recipes and decided to try it out for potential bento food. It didn’t sound like it was all that great as is, so I tried tweaking it a bit by breading it with panko before frying. The process was rather complicated: a cube of Swiss cheese went into the middle, then meat mixture to form a ball around the cube, then a roll in flour, then egg wash, then panko. Baby Girl wanted to try it so much that finally I gave in. Hers came out pretty nice! Then Buddy wanted to try, so I let him do two. Then he grabbed my shirt with his grubby, eggy panko hands and I sent him off to the bathroom. Baby Girl stayed to help roll and though she kept confirming every single step for every single meatball (“Cheese first? Meat next? Now flour? Now egg? Now panko?”) she was so good at it that I was able to leave her alone to work while I fried the first batch. Her meatballs came out nice and round. I had found the most interesting thing at Foodland, Italian Panko by Progresso but I ended up not trying it this time around though. I wasn’t sure how it would taste. It tasted okay, but definitely could have used more seasoning, so I still have some tweaking to do. I think if I had been able to find parmesan bread crumbs (I used garlic and herb), had seasoned it with salt and pepper, and had remembered to top them with the grated parmesan cheese I bought, this would have tasted awesome. I’ll try it again in a couple of weeks. 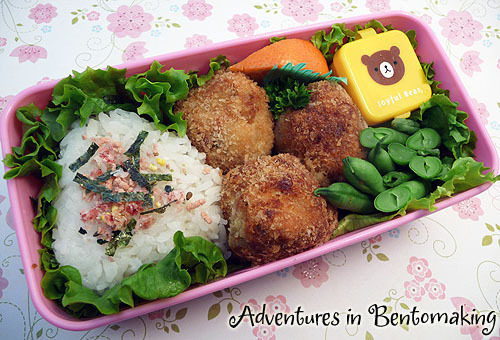 I had a bentorial for my bento, but I forgot one step, so I figured nevermind. I added lettuce first, then the onigiri, the meatballs, the sauce container with kewpie mayo for my green beans, the green beans, and then the tangerine slice. Before taking the picture I added a small piece of parsley and the pink furikake. I’ll eat the lettuce as a small salad too.